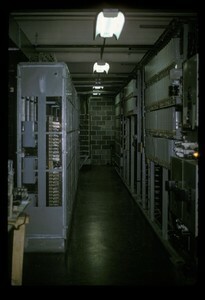 During early 1963 and into the summer, the switching equipment in the Walker basement (see photo at left) was wired, but not by Dormphone personnel. M.I.T. evidently felt this was beyond the capability of the students and wanted it professionally done. However, they also felt that the manufacturer, Automatic Electric (AE), charged too much. Therefore, they hired the AE salesman, Charlie Morse, to do the job. He relied on the assistance of a friend who wired similar equipment on Navy ships. However, the friend found the Navy work much more profitable, and rarely counseled Charlie. As a result, there were a substantial number of mistakes including cables that were terminated on one end, but hanging loose on the other. We students, principally Bob Clements, were left to straighten out the mess. The East Campus dormitories (including Senior House) were the last dormitories converted from manual to dial, and this was accomplished on September 1, 1963. My recollection is that the incoming freshmen were due to arrive for orientation beginning at 5 pm, and we finished at 3 pm – a close call. In subsequent years, the students wired everything, including the switching equipment. This summer also offered the opportunity to work on an entirely new building, McCormick Hall. Not only was the building new, all of the phones were new ivory 500-sets, rather than the bedraggled old sets that adorned the other dorms. At first I marveled at how a big, complicated building like that could be assembled without “gotchas”, but I soon learned there were plenty.